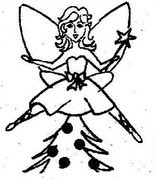 Why do we have a fairy on top of the Christmas Tree? Hundreds and hundreds of years ago, Santa was in his workshop at the North Pole getting ready for Christmas. There were only eight days to go until Christmas Eve and he, his elves and his fairies were frantic. There were still eleven million Action Men and tens of thousands of Barbie Dolls to wrap. He’d lost the string, spilt the glitter and couldn’t find the end of the roll of Sellotape. He’d had to reprimand two of the elves for abusing a Luke Skywalker figurine, and Rudolph was getting a cold. French lorry drivers were threatening to block access to French chimneys, fog had been forecast worldwide and the fairies were muttering about industrial action in pursuit of a pay demand. Santa was at the end of his tether. Just then, Tinkerbell, the queen of Santa’s fairies, put her head round the door. She had a Christmas tree in her hand. “Where do you want me to put this tree, Santa?” she asked.